There is no doubt that USA laps up the talent from all over the world. US leads the tally of Nobel prize winners which were introduced in 1901 and Economics prize introduced in 1968. Since then 585 Nobel prizes have been awarded to 922 winners out of which only 49 are women. Youngest person to receive the Nobel is Malala Yousafzai who received it at the age of 17 years in 2014. Although she belongs to Pakistan, her country may hardly be happy over her winning it. Oldest Nobel laureate is Leonid Hurwicz of US who received the Nobel in 2004 for economics at the age of 90 years. Countries at the top of list. In physics is particle physics and in chemistry is biochemistry. Research in genetics most hot topic and in economics it is micro economics. Nobel Prizes for this year are on. Already the prize for medicine has already been announced to William C. Campbell, Satoshi Ōmura, Youyou Tu on nature based medicines. Prizes in other categories will be announced one by one. There had been times when Controversies arose over the prizes. Following is the list of some controversial prizes. Literature prize to Aleksandr Solzhenitzyn in 1970. Solzhenitzyn is well known for highlighting the plight of political prisoners sent to labor camps in Siberia. The communist regime of the then USSR had declared the prize as a provocation and he was not allowed to receive the prize. He received the prize after 4 years after he migrated to USA. Economics prize to Milton Friedman in 1076 for his work on free markets. His association with Chilean dictator Pinochet irked the protesters. When Barack Obama received peace prize in 2009. He was less than a year in office. Judges noticed even Obama was not too enthusiastic about it. Medicine prize to Jules Hoffman, Bruce Beutler, Ralph Steinman in 2011. This prize would have been uncontroversial except for the fact that Steinman had died a few days earlier the prize was announced. Controversial point was that it cannot be given posthumously and commitee made the exception saying they were not aware of his death. And Nobel Prize for Mahatma Gandhi that never was. There is hardly anyone in the world who doesn’t know his contribution towards non violence. In fact he was the founder of this movement. He was nominated 5 times for the but never won. This again may be due to pressure from the powerful nation. The Nobel committee has since realized the biggest blunder they have committed. His non violence movement has in fact become guiding star for people such as Martin Luther King and Nelson Mandela. In 1989 when peace prize was given to Dalai lama the chairman of committee paid rich tributes to Gandhi. There is another Iraq. It is village situated in Ludhiana district of Punjab India. 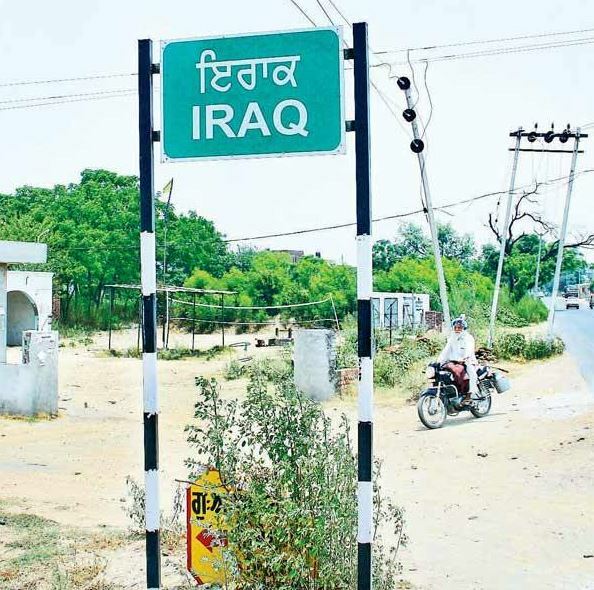 The village which is 30 kilometers from Ludhiana shares its name with West Asian country, presently torn by strife. People are being killed brutally by the terrorist outfit ISIS which some say is backed by Sunni Muslim countries like Saudi Arabia. Iraq is dominated by Shia Muslims. The Iraq in Punjab is just the opposite. Genesis of the name Iraq is like this. Earlier name was “Irakh” which is Arabic name for wild bull or pony like animal. During the periods when Muslims ruled Punjab, the people here used this animal to cross the small river which was in spate during rains. After the partition, Muslims from here left for Sialkot in Pakistan. Presently there is not a single Muslim family. People mostly work in Ludhiana factories. This name many a times, caused problems to its residents going abroad. Their passport is checked thoroughly. One of the passport officer even began locating it on the Google maps. Author Ranjit SinghPosted on June 20, 2014 Categories Places of Interest, WritingTags Crime, Google maps, Irakh, Iraq, Isis, Ludhiana, Muslims, passport, Peace, Punjab, Saudi Arabia, Shia, Sialkot, SunniLeave a comment on Another Iraq!! It has been days I have felt peace and tranquility of mind. In fact it seems that I am living in a state oblivious of my state of mind. Neither do I ever feel that I am calm, neither do I feel very much excited. What is peace after all? Some say it the state of mind when your body is in agreement with mind. There is no struggle between two of them. They seem to merge into one another. In the turbulent state of mind, mind it seems is detached from the body and hovering outside. Body and mind are completely out of sync. My state of mind is not what Buddha advocated. The middle path. In the state advocated by Buddha, there is peace of mind. Mind is unaffected overly neither by moments of happiness nor by sorrows. It is most difficult to control the feeling which comes when we are elated. We like the world to know that I am happy. When we are unhappy we seek the sympathizers. What colour is the peace? Some say it is white while others say it is green. Pigeons are symbols of white colored peace while woods are the green colored peace. But pigeons though they don’t seem to harm others, supposed to be innocent and easy target for birds of prey, are very aggressive in the company of their ilk. They will fight with each other to scare away the weaker from the food. They seem to be deeply involved in the procreation. Their droppings are very corrosive and contain an enzyme. If they fall on the cars they can damage the paint of car if not removed timely. But the enzyme has been used in the tanneries to make the softest leather as the enzyme decomposes any flesh clinging on the hide. In fact, in Fez in Morocco, famous for the best leather in the world, droppings are in great demand. Whatever the season, I always find the male pigeons dancing around the females wooing them for copulation. Woods as such seem to be beautiful from a distance. Enter into them and you will have to struggle to keep yourself safe from the animals harbored in them. There are woods which are so dense that even the sun rays find it difficult to penetrate. Peace is in our minds, it comes from within. It is the way we perceive the world. Perceptions are different for different people. Even the way we see around us depends upon whether we are happy or sad. During many moods, sometimes a thing which interested us greatly once holds no interest at a later time. Sometimes emotions seem to be cyclic in nature. We are interested in a particular thing, then lose interest in it and again some events happen which recreate the interest again. You can be at peace with yourself, if you don’t have high desires and take the life as it comes. Author Ranjit SinghPosted on January 10, 2010 May 19, 2012 Categories UncategorizedTags Activism and Peace Work, Buddha, Buddhism, desire, Fez, Gautama Buddha, Middle way, Morocco, Peace, United StatesLeave a comment on What is Peace? Life seems to an illusion. In fact, whole world seems to be a figment of falsehood. People seem to be too trivial, becoming too happy and too distraught with small achievements and losses. There is opaque gossamer which Maya has spread over this world to keep us away from the real truth. Maya schemes day and night to keep us mired in trivial attachments and actions. It dangles morsels of earthly sensual pleasures from time to time to maintain its sway over us. It makes every effort to keep us away from our creator, the real contentment and peace. By the time, us mortals realize our folly, it is too late to make any amends. We are slaves to sensory pleasures. It requires a mountainous effort to break the shackles. There is always the danger of relapse similar to the alcoholics and addicts. Its hold is so strong on the individuals that most of them make no effort to break the shackles and see the truth. The truth which is real beauty and the Creator. I am disillusioned with this world. Nothing is permanent here. All of the entities are transitory and have fleeting existence. Still we cannot think clearly and lucidly. In fact, we surrender to small and immediate pleasures. Today the thinking is to live the current moments to the full because no body has seen the tomorrow. We never contemplate our deeds. Most of us are bereft of hindsight, because at the time of passing through a crisis, we many a times think that we will not let this repeat again. We promise ourselves to examine our deeds but we become complacent and are totally ill prepared for the next events. Peace, the most cherished of the human desires, eludes me. Day in and day out, I find myself in the labyrinth of thoughts from which there seems to be no escape. I am very poor at solving puzzles and always avoided and tried to find the easy ways out. But now the differentials of the neglect have become gathering into indefinite integrals and it seems that confounding solution is near. The drops have collected to become dam and dikes are becoming weaker and any time will give way. The dam will burst. Most of the time, I am repenting on the lost time. It seemed to me that I have been a wastrel of time all these years. Other people feel like me, I doubt. But I now strongly realize that I have not utelized my potential. I have never let it convert into kinetic form and achieve somethings. I seem to feel defeated. I try to pick up the gaunlet but soon relaize the stamina is not there to translate. May be I am not so much of a failure as I think myself to be, yet I an sure I could have done much. Now, I remember the lines of song written by Neeraj, saying that I had stood watching and opportunities, bliss and happiness had passed at nearby distance. I have been a onlooker, I never tried to catch the butterflies hovering over the flowers, or fireflies in the night. I must not form any opinion about her in haste. I should give her fair deal and time. May be, she is testing me and preparing to give me even bigger surprise; to give me what she has not given to others. O my mind, don’t be narrow minded and fidgety. Be at peace and wait for some time, though her behavior till now has been very perplexing, defying all the common logic. It was not expected from her at all, the snub she has given me but at the same time behaving as if nothing has happened. I can say it emphatically that my attitude towards her has been that of help, cooperation and of friendship. Let me wait before forming any definite opinion about her.